Hello came into my life in October of 2004 as a handsome, 6-month-old tuxedo kitty, with thick black fur, a handsome white bib and tiny splotches of white on his front toes. After looking around Pat Brody for a while, I hadn't found a kitty that was quite right. The volunteer who was helping out that day suggested that I take a look at two brothers who were in isolation for minor illnesses. Hello (whose name was something completely different -- Andy #2, or something like that) snuggled up in my arms and immediately starting lavishing me with all of the love in his little heart. He had ringworm (or so we thought at the time), but he was on medication and was ready to go home, so I scooped him into a carrier, signed the papers and listened to him purr all the way from Lunenburg to his new home in Arlington. Little did we know, it wasn't ringworm! So Hello is bald in a few spots, a result of a congenital (but harmless) skin condition. But his luxurious black fur hides his patches well, and he has turned into a snuggly, wonderful, happy lap cat who runs to the door to greet any and all newcomers to his home. A few years later, in April of 2006, I had the time, space and resources to adopt again. 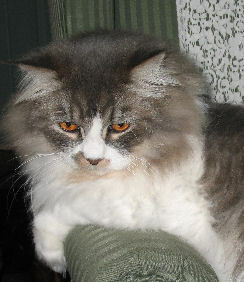 I went back to Pat Brody, and once again searched, but had a hard time finding a cat with the right size and temperament to be a good match with hefty (14 lbs!) tomcat Hello. Sushi joined my home, and I was nervous at first, worrying how the tiny 3-month-old kitten would fare against the big, black grown-up. It quickly became apparent, however, that I had nothing to worry about. In no time flat, Sushi was launching himself across the house, tackling Hello at full speed and turning into a rolling ball of cat before Hello shook him off and scurried away. Clearly, Sushi could hold his own. The battles in that first year were fierce at times, but as Sushi has left kittenhood he's mellowed out, and now (as you can see) my boys get along just fine. Sushi is an independent, curious little thing who chirps constantly and never hesitates to give me a gentle pawing when it's time to get up for breakfast! We all live in Salem now, and my kitties have earned themselves a fan club of locals and tourists who love seeing them out on their balcony, surveying their beloved Witch City below. Thanks again to the shelter, volunteers and supporters who make Pat Brody such a great place for kitties. 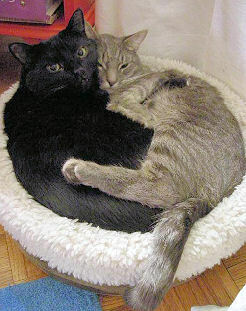 I recommend the shelter to anyone and everyone who is looking for a new cat to join their home. 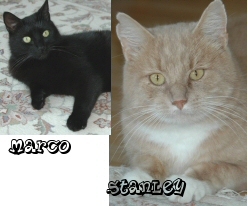 Attached are photos taken on Thanksgiving of "Cookie", aka Marco, and "Mittens", now Stanley, both now looking very handsome. 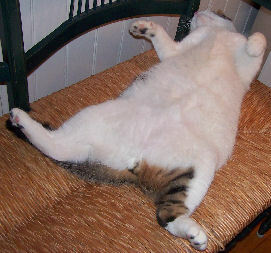 I had thought Mittens was a mellow, laid-back cat. Not true! But he is still very endearing! He is beginning to tolerate more affection. Marco continues to be a lap cat at every opportunity. In short, both are delightful. Hello! Just wanted to write and update you on my new sons! Dillion is the black and white one. He is a mommy's boy. He is two weeks younger than Cedric and he loves to follow his big brother around. Cedric is a crazy monster! He was since the moment I met him! He is a talker. Not meowing but the kitty talk. They are very energetic and playful. They go for a long time and then kerplunk! Fall right to sleep on mommy! Its like narcolepsy! They sleep on my shoulders and head! I love it! They are angels from heaven! Thank you, thank you, thank you! Hello, Priscilla and other shelter staff. I've attached two pictures of George and Yoyo, who we now call Pepper and Penny. As you can see, they're getting along very well! 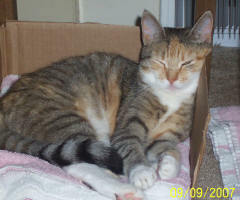 We are writing to let you know that Elsee has settled in wonderfully, and she's very happy with her new home. 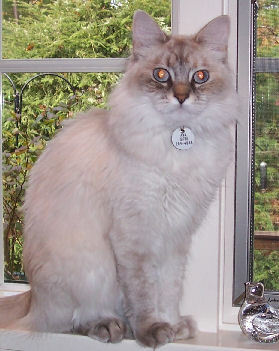 We're also delighted to have her, and she's developed quite a personality. She greets us at the door to the apartment whenever one of us comes home, she's nearly always in the same room as us, and she's started sleeping on our bed with us. We've attached a few pictures of her in her new surroundings. Thank you so much for giving us the opportunity to adopt such a wonderful kitty! Wanted to give you an update on Bene aka Kathy, who we adopted back in July. It took several weeks for him to get over his cold, start eating again and be a clean kitty once more. But the day we opened the door to the rest of the house so he could meet Bailey face to face (they were familiar with each other thru the glass door) he made himself right home and the two of them became good friends as well as a wonderful addition to the family. Now his fur is now almost completely grown back, he's matt free, and has filled out. From day one, he's always been very sociable but not overly cuddly, but as he's learned to trust us, he's now learned that petting is good, and sleeping on the bed with Bailey is the place to be. He can always be found where the action is and enjoys just hanging around with the family -- usually lying around on his back lounging around ;-). He's a wonderful addition to our home and we thank you all at Pat Brody for being his way station to his new life with us. He's a a great kitty and we adore him! I am very happy in my new home. I've adjusted well to being an indoor cat. My parents have an outside "playpen" where I can get fresh air and watch all the birds and squirrels. After my babies were adopted I became quite a kitten myself! I love to play with toys and wrestle with my brother. My mom says I made a new man out of him. We love to cuddle and give each other baths. I am the first to greet anyone who comes into the house. My parents say I'm a very smart and lovable addition to their home. Thanks so much for rescuing me. We are the family that adopted Marshall and Candice. They are doing very well and are a lot of fun. I've attached a picture of the kittens sleeping on a chair. I grabbed this picture because you rarely see them relaxing! 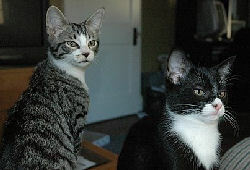 Here are a few pictures of Sophisticat (Now, Sophie) and Thompson (who is still, Thompson) ... They are very happy and healthy being in their new home! We wanted to update you on Jax and Shadow since we adopted them almost 2 years ago. Jax, as you can see from the attached photo, is incredibly comfortable with us and pretty much everything we do. He follows us everywhere and generally likes to be where the action is -- even if it's just to sleep near us. He is quite mischievous and seems to like the dirty sink water much better than the fresh water we give him every day! He has become the house alarm clock with an uncanny meow that sounds more like "neow" as in "it's 6am and I'd like to be fed now!" 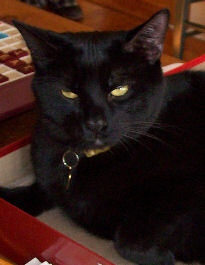 Shadow has become much more affectionate too, in his own way, usually late at night. Interestingly, while Jax is incredibly docile (allowing our son to put hats on him for example), Shadow will actually sit in your lap -- once the house has settled down -- and is quite insistent on getting as much attention as Jax does, just in his own way. 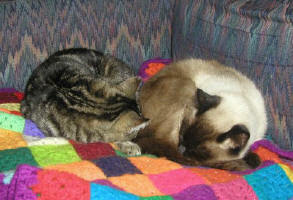 Both cats get along well with all our visitors and each other. They have what we call "crazy time" from roughly 10-11pm most nights, where they chase each other and run up and down the stairs. They don't knock anything over, but our rugs sure are a mess in the morning!! Jax and Shadow continue to be very healthy and a wonderful addition to our family. We occasionally take them out for walks with harnesses which they really love. Mostly they eat leaves, grass and roll around in the dirt. Thanks for helping us find such great cats.